Germany completed its fourth round of auctions for ground-mounted photovoltaics this month, and the government is pleased with the outcome in light of the continued falling prices. The Undersecretary in Germany’s Energy Ministry also speaks of “intense competition” as a positive outcome. The other side of that coin is a lot of losing bids – not to mention those who didn’t bother to take part. Craig Morris explains. This month, Berlin plans to amend its renewable energy policy, finalizing the switch from feed-in tariffs to auctions. 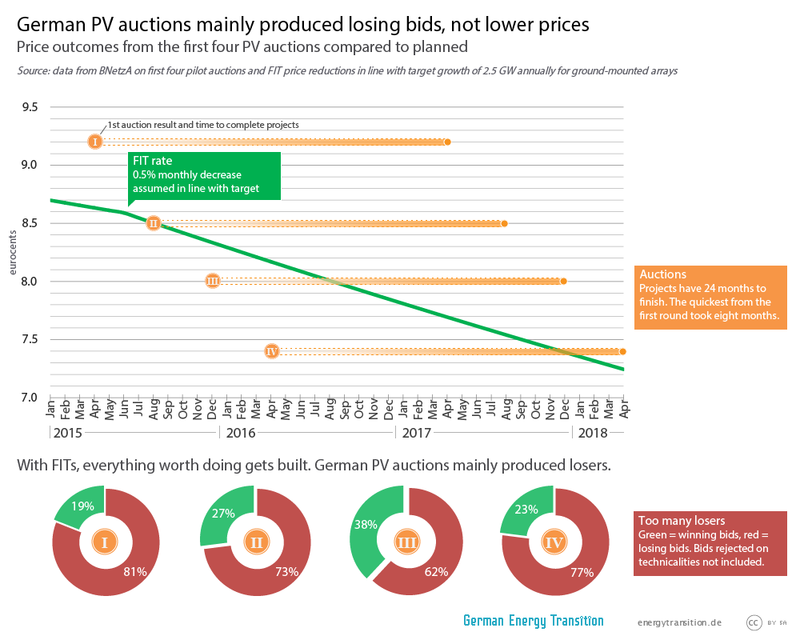 It’s not hard to understand why the German government is happy about its pilot PV auctions. Over the past year, the price has fallen from 9.2 cents in the first round to 8.5 in the second, 8.0 in the third, and finally 7.4 in the last round. PV has never been so cheap in Germany. But prices would also have come down to the same extent with feed-in tariffs. Assuming the government’s target of 2.5 gigawatts of new PV annually were met, FITs for this array size would fall to 7.6 cents (compared to 7.4 cents in the auction) by April 2018 – the deadline for completion of winning bids from the fourth round (winners have two years to build). The difference in price is thus not that great. But there is a huge difference elsewhere. 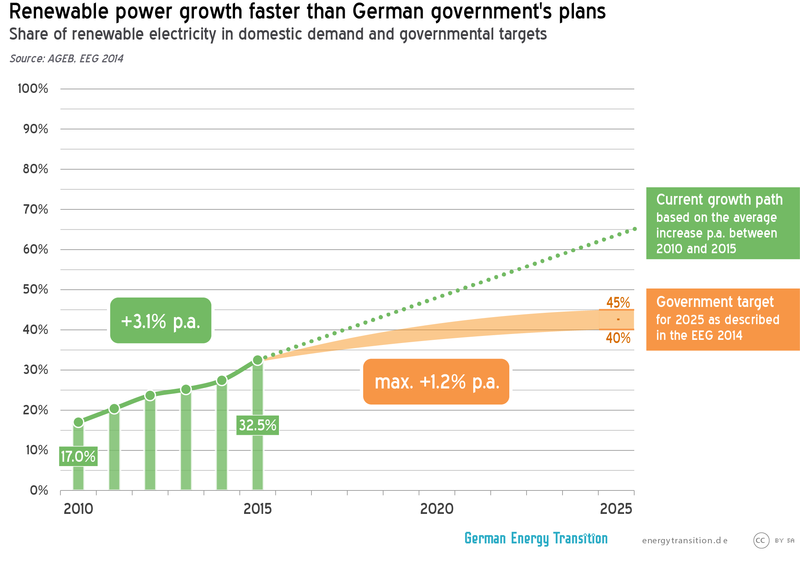 Over the last (rolling) 12 months, Germany only installed less than 1.4 gigawatts, far below the target of 2.5 GW. But instead of adding more to close the gap, less is being auctioned: 500 MW in 2015, 400 MW this year, and 300 MW next year. Lots of people want to build more, but the government won’t let them. When Undersecretary in the Energy Ministry, Rainer Baake, praises the auctions for successfully producing “intense competition” (in German), read: we continue to tell most people they can’t build. In the fourth round, 540 MW of offers were tendered, but only 128 MW will be allowed. Each of the four auctions produced more losers than winning bids. The losing bids alone would easily close the gap to 2.5 GW. 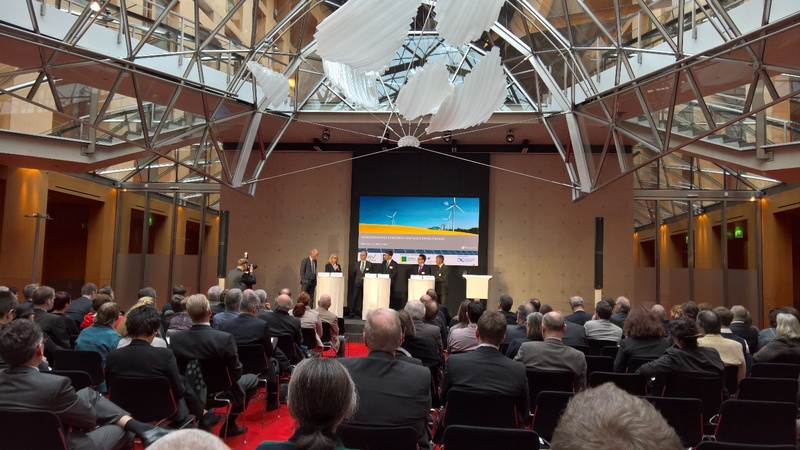 At a recent conference held by the DGRV (the umbrella organization for cooperatives) in Berlin, the Economics Ministry and energy cooperatives talked past each other. Undersecretary Baake reminded the audience that cooperatives outside the energy sector do business without fixed prices all the time. His argument is weak: coops outside the energy sector are not generally told they cannot go into business. Co-op representatives at the conference said they would be happy to accept the prices from auctions; the problem for them is the likelihood that the time and money spent on submitting a bid will be lost. At the DGRV conference in March, government and coop representatives agreed to disagree on whether auctions are good for coops. Undersecretary Baake told those calling for FITs they would “come in second” in the political debate, yet auctions produce lots of losers, too. Photo: Craig Morris. In their defense, the government and the Network Agency point out that community energy projects do sometimes win bids. In the fourth round, a full 10 of the 21 winning bids were business types (KGs and GmbH & Co. KGs) commonly used by community projects (press release in German). Clearly, policymakers are genuinely concerned about this issue. But Baake’s call for more coops to place bids will only result in more losers unless he raises the volume for auctions. In the fourth round, 77 percent of bidders lost, and the 312 MW not eligible for compensation is almost exactly the amount needed to close the roughly 1.2 GW gap towards 2.5 GW annually on a quarterly basis. What’s more, the 77 percent loser rate does not even include the number of energy cooperatives that did not even bother to submit bids. The magic of FITs was that all projects worth doing could go forward. The German government has signed on to COP21; this is no time to slow down renewables. Auctions are to replace FITs in the wind sector as well next year, which could also slow down growth there – and marginalize citizen projects in particular. A number of German states are now calling for something similar to the DGRV’s proposal: cooperatives should be able to take part in auctions as non-competitors; they would simply have the option of building at the price set in the auction (text in German). Clearly, cooperatives are willing to accept the price outcomes of auctions; but given the small number of energy projects each coop pursues, they cannot spread their losses across multiple bids the way larger corporations can. Repeatedly, the German states have managed to protect renewables in the upper house of the Bundestag. Here’s hoping they’ll pull it off again – for the sake of the climate and energy democracy. Craig Morris (@PPchef) is the lead author of German Energy Transition. He directs Petite Planète and writes every workday for Renewables International. He is currently writing a book on the switch from feed-in tariffs to auctions as a Senior Fellow at the IASS. One gets the very strong impression that the idea that auctions are better than a declining FiT is more ideological than rational. This One gets the very strong impression that the government is intentionally putting the breaks on the Energy Transition to protect the large power companies (CDU) and the coal mining union (SPD). They can’t say that out loud, though, so they pretend to be blind to the ‘failing’ of their policy, which is actually working exactly as planned. We miss Hermann Scheer !